Use of wording on the pavement surface is more dramatic than only using signing, which can get lost in the clutter of a streetscape. Pavement legend (Shauna Hallmark et al./Institute for Transportation). 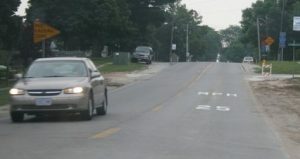 Some communities paint the speed limit on the roadway to remind drivers of the speed limit or to indicate a transition zone. In other cases, the word SLOW or SCHOOL is used. Use of wording on the pavement surface is more dramatic than only using signing, which can get lost in the clutter of a streetscape. No guidance was found on exactly where on-pavement markings should be placed. However, it is assumed that speed-limit legends would be placed on the pavement in the same locations as speed limit signs. Speed-limit pavement legend (Shauna Hallmark et al./Institute for Transportation). A study by Hallmark et al. 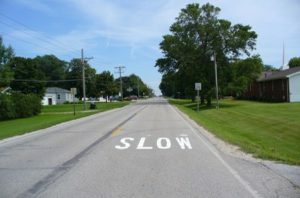 (2007) showed that the use of SLOW pavement markings did not appear to be effective. Use of pavement markings does not affect vehicle operation and is appropriate for use along major roads through small communities. The City of Winston-Salem, North Carolina (2005) indicated a cost of $25 to $50 per letter or number and $100 to $200 per symbol.